The L-Shaped Dock Seal creates a tighter seal than conventional foam dock seals by surrounding the back of the trailer and sealing it completely from the elements. It features foam side pads and an adjustable curtain that fits door openings up to 10’w x 10’h. 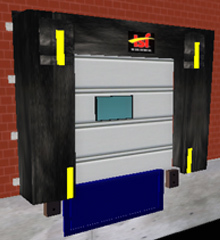 Standard units seal trailer heights 144” – 162“, on a 48” dock height. Standard side pads are 126“h x 16” projection. Openings up to 9’h include a head pad: 136:w x 12“ projection (maintain a 4” difference between side pads & head pad). Openings 10’ – 12’h include a head curtain: 136“w x 16” projection x 30“ drop with Velcro splits.